If I didn´t know about Snow Canyon State Park, I would think there are people trying to keep it secret. It must be the most under publicized and unknown parks in Utah. Sculptured sandstone beckons the intrepid climber to test the grip of his soles, and many wind-shaped bowls and pockets form a natural sandy playground for children. A good collection of live dunes graces the middle area of the park, with plenty of clean pink sand. 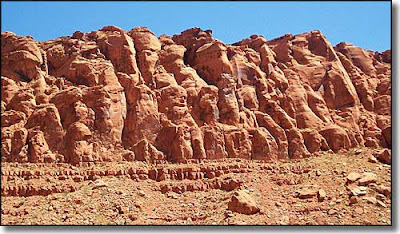 Several scenes from the film ¨Jeremiah Johnson" were staged in the Snow Canyon State Park area. Maybe you can re-enact the scene where Jeremiah and Caleb encounter Del Gue buried in the sand. Also convenient to this location are several small volcanic ash cones that are a short, fun hike. It looks gorgeous! But "sand"stone doesn't sound like something I'd want to test my climbing skills out on! Uncle Leroys kids have climbed in Snow Canyon too! That place is really fun, and it is close enough to drive to from St. George in just a few minutes. Climbing on vertical rock is all the same. You learn to work with the types of rock youŕe on. Sandstone is a bit different than gnarly granite boulders, but just as much fun, when you get used to it. And the scenery is so spectacular, the word does not do it justice. Also, nice thing about lots of short bouldering routes in Snow is that you can start with a top rope belay, which makes it nice for newbies like me. I don´t know how you feel about leader falls but I can do without. Brian and I also visited Snow Canyon a couple of summers ago, but it was so blazing hot! The red sand dunes are gorgeous too. We still have some lava rocks around the house that were souvineers for the kids! I totally want to go on my next trip out to Utah! If you look on the front row about the middle I see a face on a funny shaped man.Another is up above that one. Just use your imagination. I see Aunt Mary's funny man. He kind of looks like he doesn't have his dentures in. I think the one above him looks a little like the face on Mars. Can´t say for certain, but may be y´all have a bit too much imagination, an to much time. Just rocks, is all they are. All ´cept the guy rappelling down the face of the one rock, that is.